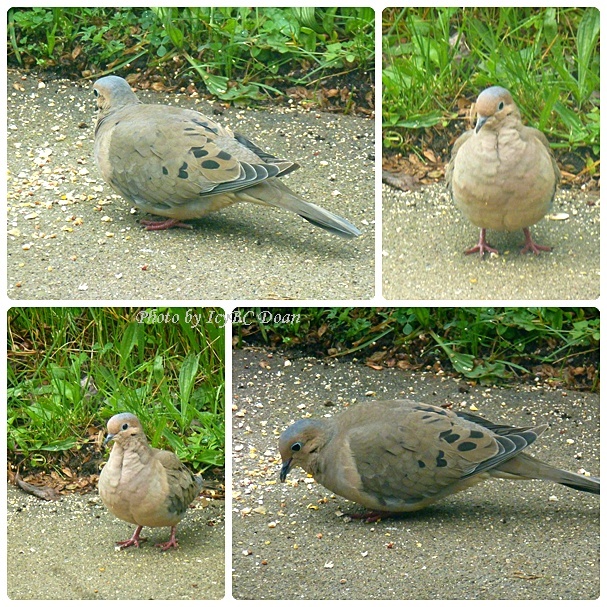 There was a pair of dove that came to my feeder and joined in with other birds. The doves were the first to notice that a human was taking photos of them. Since putting out two feeders, I got to see many birds, which was very interesting, and always had a mess on my drive. However, it was worth it as I live in the heart of a big city, and seeing different critters is somewhat challenging. I'll say good night if there is any night dove. Your mourning doves are pretty. Great shots, thanks for sharing. Beautiful colouration on those doves! You are so right, seeing critter is always worth some mess on the drive. Very pretty birds- great shots. We used to have doces outside our windows, I always thought they were such pretty birds. I have morning doves, and while I don't feed them, my neighbor does, but I get to hear them and see them as they perch in the tree between our houses!